The guitarist and singer - who first found fame as a member of Fairport Convention before his first solo recording in 1972 - has seen a surge of interest for his new release Electric. The 63-year-old is at number nine in the midweek charts according to figures released by the Official Charts Company. Often viewed as one of the world's finest guitarists, he was awarded an OBE in the 2011 New Year Honours for his services to music. Thompson's biggest solo success to date has been his 2010 release Dream Attic which made it to number 10. 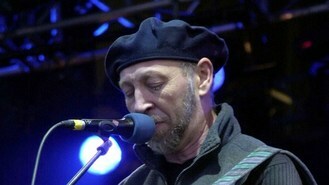 His biggest album with folk-rock pioneers Fairport was Full House in 1970, which peaked at 13. The band's 1971 album achieved a number eight position in 1971, but despite co-writing some songs, Thompson had left the band by the time it was recorded. As a solo artist Thompson has made it into the top 40 on six occasions before now, and his releases with former wife Linda Thompson failed to chart. Foals are at number one in the midweek album chart with their third album Holy Fire, looking on course to knock the cast recording of screen hit Les Miserables from the top of the charts. I Could Be The One by Avicii Vs Nicky Romero is in line to be the number one single at the weekend.